At OROGOLD, we believe that celebrations are integral to who we are as a brand. We particularly enjoy celebrating the success achieved by our staff, and for the month of July, we wish to highlight the dedication and hard work shown by Mark Angelo, the Store Manager of our Al Wahda Mall Store in Abu Dhabi. In this interview, Mark talks about his preferred OROGOLD products and also offers a few important skin care tips. OROGOLD: Tell us a little about yourself and your position at OROGOLD. OROGOLD: What do you like most about working at OROGOLD? Mark: I always love making people look good and feel good about themselves. And through Orogold I am able to make this happen everyday. I don’t think there is anything more satisfying than seeing our clients happy, and most of all BEAUTIFUL. OROGOLD: What services are provided at your OROGOLD location? Mark: Well, one of the most important things is educating customers on their skin type and helping them address the issues they face with their skin. And of course, we also provide a VIP facial experience. OROGOLD: What is the most popular product in the Middle East? Why do you think that is? 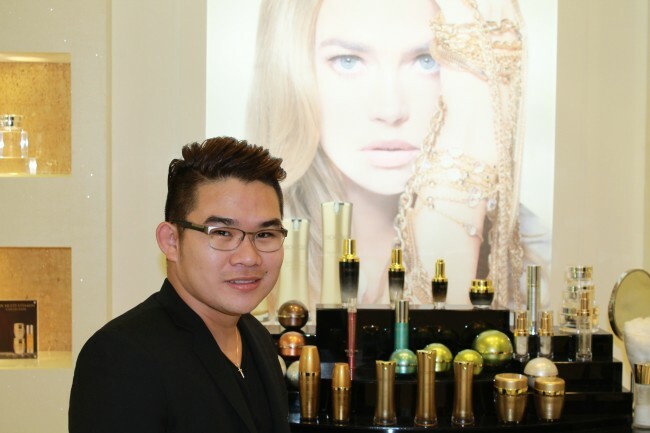 Mark: Aside from the basic lines such as the 24K Gold Deep Peeling, which I believe is one of the most popular OROGOLD products around the world, I think the 24K Termica Collection is the most popular in the Middle East. We all know that ladies love putting makeup on and this is usually one of the main causes of breakouts. I believe the 24K Termica Collection, one of the many lines we have at Orogold, is the best answer to that. With its unique self-heating technology, it helps in diminishing the look of toxins, excess oil and dirt, ably helped by the essential vitamins and special ingredients, to give you a noticeably nourished, pimple-free and glowing appearance. OROGOLD: What is your favorite OROGOLD collection and why? Mark: Well, I am one with most of the people here in the Middle East. The 24K Termica collection is my favorite. I have breakout-prone skin and Termica is the best answer to most of my issues. OROGOLD: What products would you recommend to a customer for their summer skin care routine? Mark: I would recommend the 24K Bio-Brightening Collection. Aside from its capacity to give you glowing skin, two of the main products of this line, the Bio-Brightening Skin Tone Moisturizer and the Bio-Brightening Dark Circle Eye Solution, contain SPF 30. When UV radiation penetrates the skin in excess, it can damage the skin melanocytes that produce the pigment melanin, which can eventually lead to dark spots. This scenario is mostly encountered during the summer months and the Bio-Brightening Collection provides a perfect solution to that. OROGOLD: How do customers react when they start to see results? Mark: AMAZED! They would say, for instance with the Deep Peeling, that they never thought a deep peel can actually remove dead skin without an itchy or irritating feeling. And of course, most are amazed with the fact that it contains GOLD, which adds to the classy and luxurious approach. OROGOLD: What is the worst thing you can do for your skin? Mark: Neglect. Failing to look after your skin the way you usually look after your hair and teeth is a form of abuse that can eventually lead to a serious and dangerous condition. Your skin requires daily washing, moisturizing, sun screen protection and regular professional monitoring.